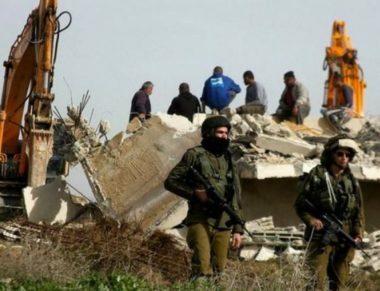 Israeli soldiers invaded, Wednesday, the al-Birin area, in Yatta town, south of the southern West Bank city of Hebron, and demolished two residential rooms. Rateb Jabour, the coordinator of the Popular Committee against the Wall and Colonies in Hebron, said the surrounded the area before invading it. He added that the soldiers demolished two residential rooms, owned by the families of Jahed and Fadel Barqan, for being built without a permit from the Israeli authorities, in the occupied West Bank. He added that the two rooms were demolished without a prior notice, or a warning, from the army. On Wednesday, October 17, 2018, the soldiers invaded Khallet al-Mayya area in Yatta town, south of Hebron, and demolished a Palestinian home.